OR Manager, the leading educational journal for perioperative medical professionals and decision-makers, highlighted Mutare Health’s Vital Link™ Surgery Status application an August 2016 article titled Secure Apps Loop in Families During Surgery. 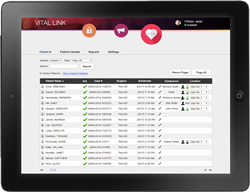 Hospitals that purchase Vital Link also gain access to secure text communication and collaboration between clinicians, multi-modal mass/group notification, automated appointment reminder, surveys. In the report, Lexanne Dawent, BSN, RN, manager of perioperative services at Springfield, Illinois-based Memorial Medical Center, notes the significant increase in patient satisfaction survey scores following the implementation of Mutare’s Vital Link platform. As a Level 1 trauma center, Memorial Medical Center performs up to 11,000 surgeries annually and a recent expansion from 18 to 23 Operating Rooms was placing a strain on staff and volunteers tasked with keeping family members informed during procedures. “We had a process in place, but it was broken and manually focused,” Darwent commented, noting problems with timeliness of communications as well as privacy concerns over calling out patients’ names and surgeons talking to family members in public. Now, working from the secure, web-based Surgery Status Update dashboard, wait room personnel can track the status of all active patients and securely deliver regular text-based updates to waiting family members on their mobile phones. Waiting companions are now free to move about the facility knowing they will not miss important messages. Additionally, staff can use the application to notify the family members when it’s time to meet the surgeon for the post-surgery follow-up, reducing down-time for the physicians and enhancing overall operational efficiency. In the first six months since Memorial Medical Center implemented Vital Link Surgery Status Update, patient and family satisfaction scores on an internal survey rose from 4.1 (on a 5-point scale) at baseline to 5. All of the following Press Ganey scores — information given to the family, comfort of family in waiting area, information about delays, concern for privacy, and overall rank — also improved, which directly impacts the level of Medicare reimbursements tied to patient satisfaction under the Affordable Care Act. For more information about Mutare Health and Vital Link, visit http://www.mutarehealth.com.